For nearly a decade, scientists have been striving to make use of the incredible information storage capacity of the DNA molecule, in order to overcome present computer technology limits to miniaturization. DNA can hold more information in one cm3—about 1/5 of a teaspoon—than could be stored on a trillion CDs (see Creation 20(1):6, 1997). Researchers have now assembled the first programmable autonomous computer machine in which the input, output, software and hardware are all made of biomolecules. This machine is so tiny that a trillion of them could all fit into just one test tube. At this stage it is still too basic to have any immediate practical applications. Nature, 22 November 2001, pp. 430–434. Evolutionists have long used the perceived non-functionality of the human appendix as evidence of evolution, claiming it is a useless evolutionary leftover. Significantly, the evolutionary-focused journal Scientific American now admits that the appendix does have a role after all. It now says that there is a growing body of evidence which indicates that the appendix has a significant function in the body’s immune system, e.g. in relation to ulcerative colitis and other inflammatory conditions. It may be particularly important in infancy and childhood. Scientific American, November 2001, p. 84. This is years after AiG publications have highlighted these facts, e.g. The human vermiform appendix, Tech. J. 3:31–38, 1988; Your appendix ... it's there for a reason, Creation 20(1):41–43, 1997. Sadly, millions are still being taught otherwise. A group of researchers has cast further doubts on claims by NASA scientists that the famous Martian meteorite ALH84001 contains evidence that ancient bacteria lived on Mars. Much publicity had been given to the possibility that magnetite crystals in the meteorite had been produced by bacteria (Mars microbes again? Creation 23(3):7). But the new research has found significant differences (e.g. size distribution, morphology) between bacterial crystals and the meteorite’s crystals. Thus the meteorite cannot be used as evidence for the ancient Martian-life theory of the NASA scientists. Proceedings of the National Academy of Sciences, 20 November 2001, pp. 13490–13495. An Egyptian hieroglyph shows men holding ropes linked to something like a ‘giant bird’ in the sky. This has prompted the suggestion that purpose-built kites may have been used to help in constructing Egypt’s famous pyramids. To test this, aeronautics experts rigged up a pulley system connecting a 40- square-metre (430-sq.-ft) ‘para-foil’ sail to a 4.5-metre (15-ft) obelisk in an endeavour to raise the stone from horizontal to vertical, using only the wind. Although the 16–20 km/hr (10–12 mph) wind was only around half as strong as that calculated to be necessary, the 3.5-tonne column was lifted to the vertical in just 40 seconds. While some Egyptologists remain sceptical, it is known that other ancient cultures knew about kites—the Chinese used them as early as 1250 BC to deliver messages and to dump flaming debris on their enemies. New Scientist, 27 October 2001, p. 43. While ancient peoples are often portrayed as ‘primitive’, evidence increasingly suggests otherwise. Researchers have discovered that the hexagonal cells that hornets build (as do wasps) for brood-rearing each have a tiny (1/10 mm) crystal of magnetic iron titanium oxide glued to the centre of the roof. They speculate that the crystals form a network that may act like a surveyor’s spirit level. This enables the hornets to assess the symmetry and balance of the cells. New Scientist, 9 June 2001, p. 23. After discovering the remains of an ancient ‘Stone Age’ farmhouse, complete with living area, bedroom and kitchen, in Perthshire, Scotland, archaeologists concluded that the builders were skilled engineers. The Times , <www.thetimes.co.uk/article/0,,2-2001311378,00.html>, 26 September 2001. Not surprising, since these were post-Flood descendants of Noah. The so-called ‘mass extinctions’ in the fossil record were at best ‘mass depletions’—or perhaps never happened at all. This is the conclusion of several research groups who have re-examined fossil evidence and found glaring discrepancies. For example, 15 out of 29 genera thought to have died out in an ‘extinction event’ actually reappear higher up the fossil record—‘as much as 20 million years’ later. Described as ‘Lazarus taxa’, these species have forced paleontologists to completely revise ideas about ‘prominent mileposts in the geologic record’. Science, 10 August 2001, p. 1037; 7 December 2001, p. 2073. This casts grave doubt upon the whole method of ‘index-fossil’ dating. The year-long Flood of Noah’s day (around 4,300 years ago) and its aftermath accounts for most of the layers of fossil-bearing sedimentary rock all over the world. Thus ideas that rocks reflect millions of years of evolutionary history do not stand up to scrutiny. For over 100 years, artists have wrongly placed dinosaur nostrils on top of their snout, perpetuating the reconstructions of 19th century scientists who had assumed that large dinosaurs must have lived in rivers, lakes and seas. Although years later it was realized that sauropods were mainly land animals, the nostril position was not debated because in almost all cases only bone is fossilized, so paleontologists could only guess where the flesh went. But anatomists have recently readdressed this issue, and now consider that in many dinosaurs the nostrils would have lain further forward and closer to the mouth than shown in museum reconstructions. Science, 3 August 2001, pp. 779, 850–853. Yet another example of how fossil reconstructions are heavily based on assumptions. Charlie Cockell, scientist at the British Antarctic Survey, believes microbes from Earth not only landed on Mars in the past, but possessed the hardiness to survive to this day. The Independent (UK), 19 October 2001, p. 8. We indicated (Creation 18(3):7, Life on Mars? 19(1):19) that if bacteria should ever be discovered on Mars, they would likely be from Earth. Life cannot evolve from chemicals, and since the biosphere was created for man on Earth, it is highly unlikely that God created bacteria elsewhere. A mutation (inheritable genetic mistake) prevalent among humans in Africa lowers the risk of severe malaria by up to 58% by helping to block reproduction of the malaria parasite, borne by mosquitoes. However, people with this mutated G6PD gene can develop severe anemia from infection, drugs or eating certain foods—e.g. fava beans. Science, 20 July 2001, pp. 389, 442–443, 455–462. Some evolutionists cite such examples as proof of evolution occurring. However, no new gene has arisen, but a damaged version of an existing one (G6PD). It is thus normally harmful to health, but in malaria-prone regions, the faulty gene is of some advantage. Sickle cell anemia is a similarly ‘useful’ defect (Creation Sickle-cell anaemia does not prove evolution! 16(2):40–41; Rats! Another case of sickle cell anaemia 17(2):44–45). To the dismay of public health officials, researchers have confirmed what has long been suspected—that whole gene structures can jump from one bacterium to another. This means that, for example, staph. bacteria (Staphylococcus aureus), which cause a variety of illnesses, can easily exchange genes with other bacterial strains. The bacteria can therefore rapidly (within hours) acquire a resistance to many types of antibiotics. Such gene swapping, or ‘horizontal gene transfer’, appears to happen much more frequently than microbiologists can yet explain. Proceedings of the National Academy of Sciences USA, 17 July 2001, pp. 8821–8826. Nature Science Update, <www.nature.com/nsu/010802/010802-7.html>, 2 August 2001. Appearance of antibiotic-resistant strains by this mechanism is not ‘evolution’. This is because the genes conferring resistance already existed beforehand—i.e. there is no new genetic information. The genetic closeness of the so-called ‘races’ has again been highlighted by research, this time in the area of prescription medication. When new drugs are clinically trialled, researchers note a person’s ethnic origin, to see which groups will react to the drug differently from others. However, a team of geneticists from London’s University College showed that directly looking at variable regions on the DNA was a better predictor of drug reactions than were ethnic origins. Although these small variations may correspond with ethnicity, often they do not. The fact that there is as much, if not more, variation within than between any ethnic grouping should not surprise us—all people are closely related, by recent common descent from Noah’s family. Confronted by the rate at which mountains are eroding away, geologists are altering their theories about mountain formation. For example, the Appalachian and Blue Ridge mountains were thought to be 300 million years old, but if so, they would not be standing today, as erosion is calculated to reduce a mountain range by 90% of its height in 20 million years. Consequently, geologists are now thinking that these mountains, which ‘should have eroded away 100 million years ago’ must somehow be renewing themselves, i.e. are still growing. The Cincinnati Post, 7 December 2001, p. 22A. A simpler explanation is to accept this (along with much other evidence) as indicating a young Earth, only thousands of years old, rather than millions. See Giant oysters on the mountain, p. 54. ‘The origin of snakes has recently become a paleontological “hot potato”?. Two groups of scientists have come to very different conclusions from studying the same fossils. Are there tests capable of rejecting either one of these alternative conclusions or will human interpretation always allow such differences of opinion?’ (emphases added). 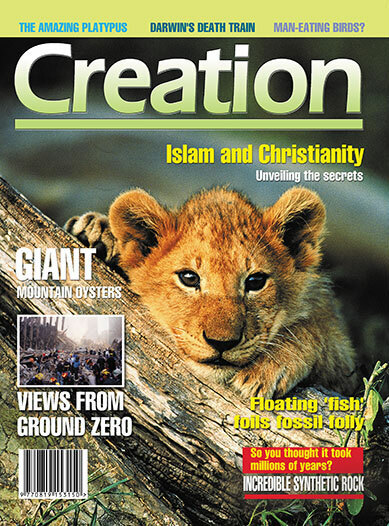 Biologist, June 2001, pp. 110–114. Most creationists would have few problems with either interpretation, in principle (even to the point of allowing for the possession of limbs in the past (Genesis 3:14)), for snakes remain snakes, with no evolution in the particles-to-people sense. Note, however, the way in which different scientists, with the same evidence, cannot agree about relatively small changes that have led to today’s different snake species. This is normal in historical science, but is relevant to assessing evolutionary claims about completely new kinds of animals arising.